The Progress-Focused Approach: When to interrupt? In progress-focused conversations you will not often interrupt your conversation partner. Sometimes, however, you will deliberately interrupt. Here, I explain when and how you may do that. As a rule, progress-focused coaches and managers do not interrupt their conversation partners during conversations. They ask questions, listen attentively, encourage, and respond respectfully to what is said. Because of this, their conversation partners will feel that their perspective is taken seriously and that they have time to think calmly about what is important to them. Still, occasionally, it can be useful and necessary to interrupt during progress-focused conversations. There can be three reasons for doing that. The first has to do with time. When your conversation partners keep on talking while there is little time left it can be sensible to interrupt them to point out that time is running out. This provides the opportunity to discuss how the remaining time can be used most usefully. An example of what you might say in such a situation is: "Sorry to interrupt you. I've just noticed that we have only 5 minutes left ... Shall we have a look at how we can best use these remaining 5 minutes?" A second reason has to do with how you perceive the usefulness of what is being said, or rather the lack thereof. Sometimes things happen during meetings which do not seem to work in the light of the goal of the conversation. 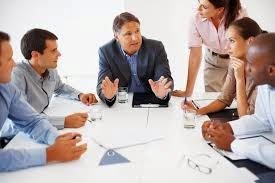 When you, as a coach, facilitate a team meeting and the participants are going on an on about a topic which was not on the agenda, it may be wise to interrupt. This gives you and them the opportunity to talk about the best use of the time available. An example of what you might say is: "Sorry to interrupt. We said we would talk about topic A and we have been talking for some time about topic B, now. Is it useful for you to keep talking about topic B or does it seem more useful to go back to topic A? If you are in a management role you can be more directive. In that case you might say something like: "I'd like to interrupt this. We have been talking for a while about topic B. And while that is an interesting and important topic I would now like to return to topic A because, in this meeting, we have to make a decision about that. I suggest we continue talking about topic B in our next meeting and now I'd like to hear your thoughts about topic A." A third reason can have to do with your own perspective. A good reason to interrupt is that you can no longer follow what is being said, or you're not sure you can follow. For example, when someone uses words you do not understand it can be useful to interrupt and ask what they mean. When someone has been talking for some time you may not be sure whether you have understood everything that has been said. An interruption can then be useful to check whether you have understood the other person. You may say something like: "Could I just interrupt you for a moment? I would like to check whether I have understood what you have said. Could I try to summarize what you have said?" Interruptions can thus be very useful. But in progress-focused conversation the rule remains that you do not interrupt. Interruptions are exceptions to that rule. Two things are important when interrupting. The first is that you explain why you interrupt. By explaining why you interrupt, the other person see it as legitimate and useful. The second thing is that your tone is friendly and non-controlling, perhaps even apologetic. Such a tone also makes your interruption much easier to accept.